I mentioned previously that we went to a wedding in Pennsylvania last Friday. Our friends DM and CN were married. Like many of the friendships we made at university, we met them through international student connections/international interests, and eventually we all lived in the International House on campus together. I remember meeting DM pretty early his freshman year. Three years before I had attended an international youth summit in Washington DC and had made a friend who lived in the Netherlands but was Bulgarian by birth/heritage. I kept in touch with this friend for several years, and had learned a bit about both these countries through him. So when I met DM for the first time I was happy to pull out the few words of Bulgarian I knew– Как сте? (Kak si-te? How are you?) and Добре съм (Dobre sãm. I’m fine) which was probably pretty unexpected from an American girl in rural northern New York. Although we are both American, CN and I had similar intercultural interests—we both studied in France but during different semesters. Her freshmen year roommate was from Kenya, another eventual close friend of ours, and my Swahili language teaching assistant. All of us wound up in the International House for the rest of our college careers. Eventually CN and I both enrolled in the same international education masters program, and we both have jobs working with international students (she’s an ESL teacher) in addition to both being married to former international students. At your own wedding, the guests are there because they know you, so there are so many people to talk to. I remember people constantly approaching us, asking us for pictures, wanting to chat, wanting to dance, it felt a bit overwhelming sometimes, and certainly added to the feeling that time was passing so quickly. At someone else’s wedding you think about how you don’t know a lot of people, and how you want to be that person approaching the bride and groom to talk, to steal them to take pictures, to dance with them on the dance floor, but you try to be understanding because you know how it feels to be inundated. It is certainly more relaxing to be at someone else’s wedding. To have a drink or two during the cocktail hour, to sit back and enjoy your meal, and dance your heart out on the dance floor without worries or distraction. It also hits you that your wedding time is really over. You are not the “bride” anymore, but a “wife” which has its own mystique and excitement. They did one of those anniversary dances during the reception where all the married couples dance to a song and the MC calls out dates, and the longest married couple is the last remaining at the end of the song. P and I were the first ones off the dance floor when the guy called out, “Anyone married a month or less?” It will be a month next Tues/Wed. Holy cow… a whole month already, where did that month go? Can’t time just stand still for a little while? Fat chance with international orientation coming up in the next two weeks with our largest international class ever. My summer is pretty much over now. I better finish my last two wedding posts before I forget to jot down my “white wedding” thoughts. The lyrics are actually not that positive about American women, but it has a catchy tune. Again please, I poll you dear readers, for feedback. Have I added too little, too much? I’m I missing anything glaring? Does it sound okay or weird? Suggestions?? Nepal is a small but diverse country– with a population of just 30 million, there are nearly 40 ethnic languages spoken within its borders–thus it is not surprising that there are many different wedding traditions which can vary by caste and ethnic group. 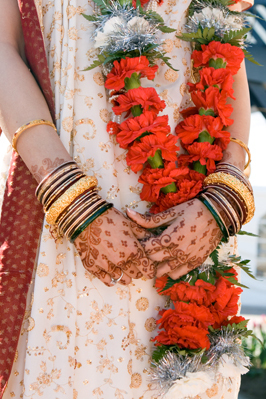 80% of the population is Hindu, so many common wedding traditions include Hindu rituals. In Nepal, wedding ceremonies include several rituals and receptions which can sometimes last up to a week. However, these rituals are now often condensed into a shorter ceremony when conducted outside of Nepal. Wearing Red– the bride wears a red sari, traditionally chosen by the groom’s family (hence “red” wedding). The bride’s look for such a wedding is to appear ornate and highly decorated. 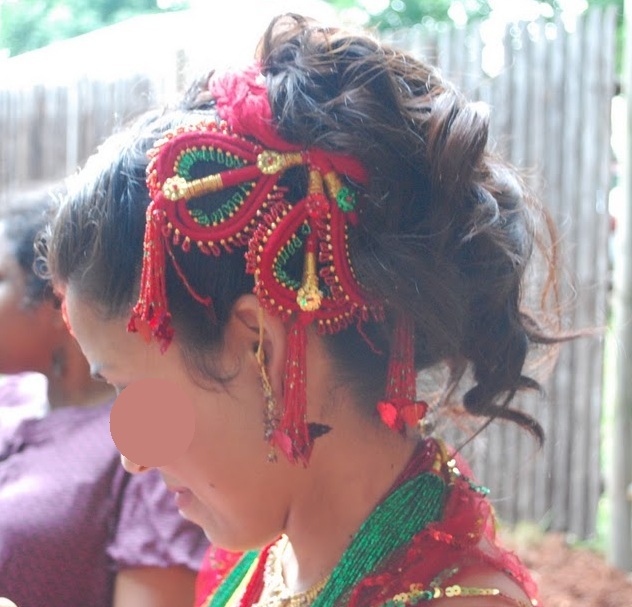 Jewelry can be very heavy and is often costume, and intricate henna designs, tikkas, and make-up add to the decoration. Clothing and even shoes are often highly intricate and decorated with jewels/embroidery and contrasting colors (most often red, green and yellow/gold). Conversely white wedding brides attempt to have a more minimal, subtle, simplified look. For the ceremony the groom wears a daura suruwal and Nepali topi hat which is very typical of traditional Nepali male clothing. Whereas saris are more pan-South Asian, daura suruals and the its distinctive dhaka fabric are solely Nepali. Back in Nepal the groom’s family comes in a procession to the bride’s family in a parade called the “janthi” which often includes music and dancing. Family members of the janthi often wear matching clothes (saris, etc). This isn’t as common with Nepali weddings in the US for logistical reasons. The ceremony is conducted by a Hindu priest. Often the prayers in the ceremony are in the Sanskrit language (Sanskrit is to Hindi and Nepali what Latin is to French and Spanish). During the course of the ceremony the priest will often break from prayer to ask details about the bride and groom such as their ancestors’ names to include in the ritual blessings. In addition to the bride and groom, sitting on the altar with the priest are both sets of parents. Each set sits next to their child and contributes to the ceremony by performing tasks as indicated by the priest– this includes touching rice, flowers, water, oil and fruits to their foreheads and various ritual objects on the altar. The pivotal part of the ceremony comes when the bride and groom exchange flower garlands and the groom gives a wedding pote (beaded necklace) to the bride. A long thin white cloth is then extended from the bride’s forehead to the altar and the groom sprinkles orange sindor powder from the bottom of the cloth up to the part in the bride’s hair. The third time that the sindor is sprinkled from the bottom of the cloth to the bride’s head is the moment the bride and groom officially become married. After this section of the ceremony the priest lights a fire and the bride and groom make agreements to each other as husband and wife, often throwing rice into the fire as part of the ritual. Depending on the tradition, the bride and groom are sometimes tied together and they circle around the fire 7 times, since in Hindu culture a marriage isn’t just for one lifetime, but for seven. In Nepali culture feet are often taboo– it is considered rude to point your feet at someone, and offensive to touch someone with your feet. However, when showing great respect, especially to an elder, it is customary to bow and touch their feet. During the ceremony the bride may touch the feet of the groom, and the bride and groom might touch the feet of their parents and vice versa. During Nepali receptions the bride and groom often sit on chairs at the front of the room, sometimes with family members, and wedding guests come up to greet and congratulate them. This is often when gifts are given, in person, to the bride and groom. Common gifts include flowers or money in denominations of +1 (21, 51, 101, etc) since the +1 is considered auspicious. Food is served buffet style at the reception. If the reception is taking place at a Hindu temple alcohol and meat are not allowed. During the ceremony the altar is considered a temple area, so all the participants on the altar have to take off their shoes. One tradition is for the bride’s sisters to steal the groom’s shoes and demand money for their return. He can’t get them back during the reception until he has satisfied the sisters with an appropriate monetary reward. Also traditionally the bride might play a few games with her mother-in-law as a way to welcome the new bride to the family. These games might include sifting through a large bowl of uncooked rice to see who can find a coin, nut or fruit first. These games would often be played when the mother-in-law welcomes her new daughter-in-law to the family home for the first time. Sometimes these games are played at the ceremony/reception if the family doesn’t live together in the same house. Lastly, small wedding favors are usually distributed to the guests. These are often small packages of dried nuts, fruits, spices and chocolate. I mentioned in my post white wedding/red wedding that I was making a website with ceremony information and places to stay, etc, for our guests. 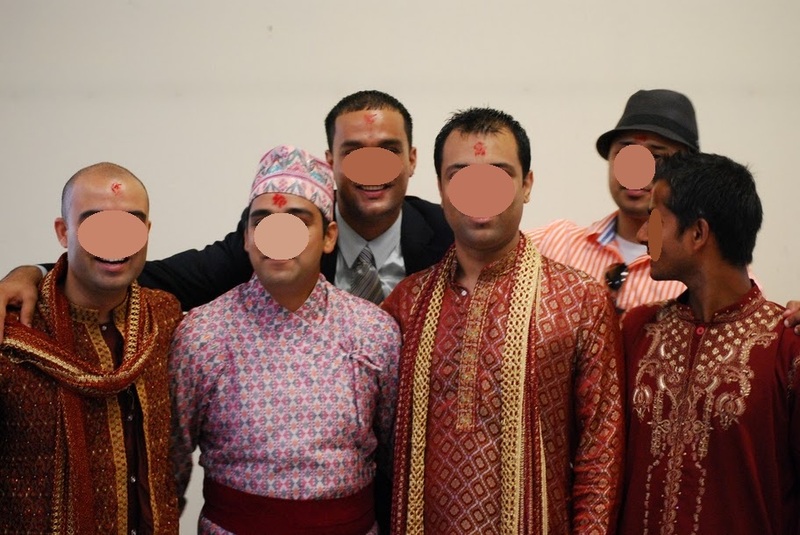 In order to help guests learn more about the different cultural traditions (hey, I’m an international educator at heart) I wanted to have a page on Nepali ceremonies and American ceremonies to give an idea of what to expect for people who haven’t attended one before. Before sharing with friends and family, I wanted to run my information by you, dear readers, first. Have I added too little, too much? I’m I missing anything glaring? Does it sound okay or weird? Suggestions?? The US houses many different cultures with varied rituals and traditions, and so it is hard to describe what a “typical” American wedding looks like. Contemporary weddings also incorporate new ideas and trends unique to a particular couple, so one wedding may look very different than another wedding of someone from a similar background. -Bridal Party: Often the bride and groom have several family members and/or friends who “stand” with them as support during the wedding ceremony. They can be identified by the clothing they wear, which generally matches the color theme and style of the wedding. The female attendants are referred to as “bridesmaids” with the main attendant referred to as the “maid of honor,” and the male attendants are called “groomsmen” with the main attendant referred to as the “best man.” The bridal party walks in with the bride and groom at the start of the ceremony. -Parents and grandparents of the bride and groom are recognized during the wedding by wearing a flower and processing down the aisle at the start of the ceremony. The father of the bride traditionally walks the bride down the aisle before “giving her away” to the groom at the start of the ceremony. Some cultures, such as in Jewish tradition, have both parents walk the bride down the aisle. Parents typically sit in the front row of seats, but do not stand with the bride and groom at the altar like the bridal party. American wedding ceremonies can be either religious or secular and can be presided over by a member of the clergy or by a layperson. Religious ceremonies usually include readings from religious texts that are relevant to marriage and love, while secular ceremonies include readings of poems, passages from literature, or cultural blessings on marriage, home, and love. A common element in weddings (both Christian religious and secular) is the “unity candle”– two smaller candles are lit by the parents of the bride and parents of the groom, the bride and groom then take their respective “family” candles and together light a larger candle to symbolically represent their “unity” as a new family. Other similar rituals include taking separate jars of sand and combining them into a larger vessel to symbolize the new family unit. The pivotal moment in an American wedding is the recitation of the vows. The bride and groom make a list of promises to each other that they vow to keep until “death do [them] part.” These vows can either be written by the bride and groom or they can use standard vows. After the recitation of the vows the bride and groom exchange their wedding rings which symbolically unite the pair as man and wife. At the end of the ceremony the officiant declares, “By the power invested in me by the state of _________, I now pronounce you man and wife, you may now kiss the bride.” The kiss concludes the ceremony, with the bride and groom officially married. Immediately following the ceremony is a “cocktail hour” where drinks and appetizers are served. Typically during this time the families of the bride and groom take formal wedding photos. Generally tables are assigned to the guests, and a seating chart is available for people to find their appropriate seats. After the cocktail hour guests are ushered to the main reception area to formally receive the bride and groom. The reception begins when the bridal party and the bride and groom are introduced. This is sometimes followed by brief toasts given by the maid of honor and best man, and sometimes a parent or relative of the bride or groom. This is followed by the first dance of the evening reserved for the bride and groom to a song of their choosing. Occasionally a “father/daughter” dance for the bride and a “mother/son” dance for the groom are also organized. After dinner the wedding cake is cut by the bride and groom and the first piece is shared between them before the rest of the cake is sliced and served. The rest of the evening is filled with eating, drinking, dancing and fun. In keeping with the general theme of “Stuff Nepali People Like” I wanted to take a minute to mention whiskey. Particularly now that I have attended a few Nepali weddings it has become abundantly clear that Nepali men (I know, I’m generalizing) seem to enjoy whiskey–or at least it seems to be the hard liquor of choice. Last summer when P and I were traveling to Nepal we had a layover in Qatar. Our friends R and S took the same flight several days before, and S had asked us to pick up several bottles of Johnny Walker at Duty Free to bring to his wedding. He had done the same during his transit, but there was a limit to how many bottles could be brought through the Kathmandu airport. We dragged the bottles from Qatar, to Kathmandu and through the janthi in Chitwan but everything got so chaotic near the end of our journey that I actually lost sight of them after awhile. Hopefully the whiskey made it into the right hands, but even if it didn’t, I’m sure someone really enjoyed it. At R and S’s wedding reception there were two places set up for drinks on opposite sides of the venue—the bar, and then the “ladies bar.” The bar served beer and, of course, whiskey (perhaps some came from our Qatari Johnny Walker?). The “ladies bar” served soda and wine. I asked someone why there were two separate bars, thinking perhaps women weren’t suppose to drink beer and whiskey. I was told this was “in fashion” and also that the ladies didn’t want to be crowded around by the men. At the “ladies bar” they had space to stand around and gossip with each other over wine and soft drinks. Hmmmmm. Another wedding I attended in Kathmandu the waiters were circulating with glasses of wine and whiskey, while at AS and N’s wedding they received a few gifts of bottles of whiskey from family and friends. One of which, I must admit, was polished off last night during a dinner party… where more than half the guests were Nepali men. I don’t want to scare people away with excessive wedding talk, but as I mentioned in “Wedding Season” our house was the wedding house for our dear friends AS and N last week and there was too much interesting blogging material to ignore. Not only did they have a beautiful wedding ceremony, and an informal fun reception for 70 guests, they planned and executed the event in approximately two and a half weeks! They were even able to coordinate having some of their wedding necessities sent from Nepal through various travelers making their way to New England. For someone who has a year to organize, their feat was quite amazing! Unlike our friends R and S, AS and N had a one day ceremony/reception. Our Nepali wedding will be relatively similar, perhaps even in the same temple. Rather than go to the Nepali priest who performed P’s Brathabandha, they opted to go to a South Indian temple in another nearby city. 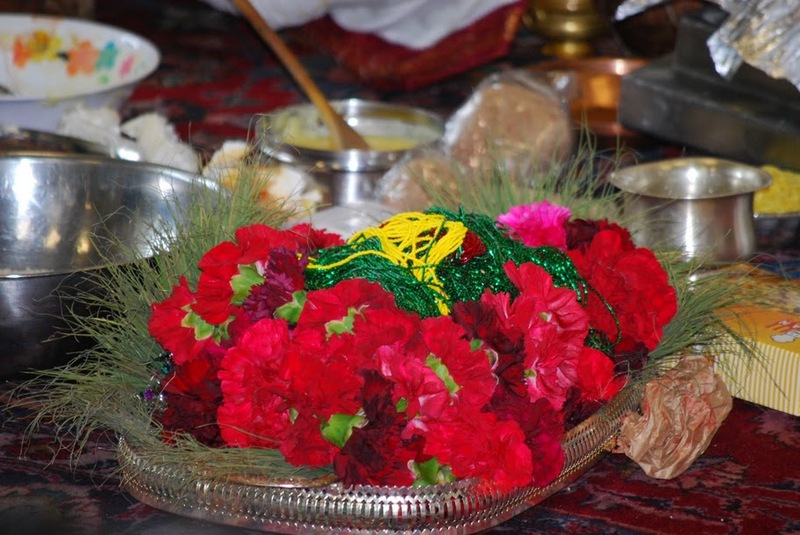 Thus the rituals were a hybrid between Nepali and South Indian traditions. AS wore a sari sent by N’s mother in Nepal. Along with the sari the couple had wedding pote, wedding bangles, grass garlands, and sindoor sent from Kathmandu. As promised, I made flower wedding garlands (called “mallas”) for the ceremony. It was much easier than I thought. I purchased a yarn needle and some green yarn to string the flowers, and I cut the stems off the carnation heads before making the necklaces. I kept the mallas covered in a damp towel in the refrigerator overnight to keep the garlands fresh for the morning ceremony. The mallas turned out well, and added a colorful fragrant touch to the ceremony—I was quite proud of myself. and of course the important moment when the groom applies the bridal sindoor and the couple becomes officially married. White cloth is stretched from a representation of god to AS's forehead. N sprinkles sindoor starting at the base of the cloth up to AS's hair. On the third sprinkle the couple is officially considered married. As a gesture of tradition and respect AS bows to touch N's feet but N tries to stop her and get her to stand. At the end of the ceremony some of the younger neighbors played the role of AS’s sisters and (as per tradition) stole N’s shoes— he had to pay some cold hard cash before the girls would return them. AS’s brother carried AS on his back around the wedding car as a way of saying goodbye to her as a member of their family and the couple drove to our house where N’s extended relatives officially welcomed AS to the family by performing several simple Mukh Herne rituals. Afterward the couple arrived at their reception which was set up in a neighbor’s backyard and catered by a new Nepali restaurant (the Yak and Yeti) in Boston. Once AS removed her red sequined veil at the reception, we could appreciate her beautiful wedding hair style complete with traditional red dori hair decoration. So congratulations and a long happy life to the new married couple! …but I wanted to mention a different kind of ruby slipper. There are special Nepali wedding shoes that brides wear during their ceremony, and often afterward these shoes can be used as slippers in the home. 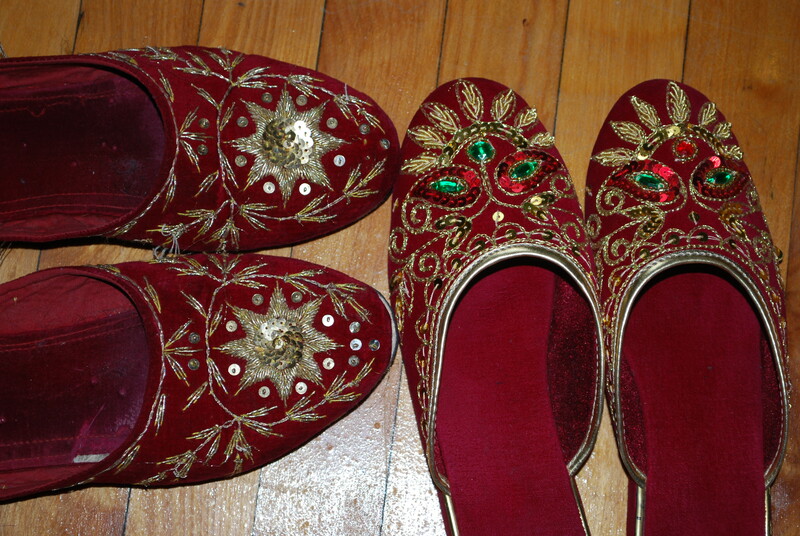 Since Nepali wedding colors are most prominently red as well as green and gold/yellow, the shoes are usually predominantly red with green and gold/yellow embellishments. Actually the first gift that P brought back from Nepal for me, my sisters and my mother were these wedding slippers. Unfortunately he underestimated the size of American feet compared to Nepali feet and the slippers didn’t fit most of us well, but it’s the thought that counts. I still have a pair of wedding slippers that I wear around our apartment, and with the wedding last week there were several other pairs floating around. Toto… we might not be in Kansas anymore, but maybe Kathmandu! Wedding season is upon us! It feels that way at least, with a wedding happening in our house tomorrow. No—I didn’t decide to jump the gun, our summer roommates and good friends AS and N are getting married tomorrow. Our whole household has been very busy helping them organize, and I’m excited to see it all come together tomorrow morning. I’m also excited to help make flower garlands for the wedding ceremony tonight. I found a bucket full of red carnations at the store yesterday, and bought some green yarn and large needles to string the flowers. I’m getting all sorts of ideas. Last night we had a sangeet/bachelorette party for AS—a sangeet is an Indian tradition not Nepali, but we thought it would be a fun way to have a ladies night anyway. We ate lots of great food, including one of my favorites– pani puri, listened to Bollywood music, rubbed turmeric on the bride’s face and arms to give her a “golden glow” (which she certainly still has this morning… even I do, my fingers have been stained yellow from painting her face), had lots of drinks (well, it was a bachelorette party), and then made henna designs (which could have been a lot more interesting considering the drinking, but my hands look descent enough this morning ;)). I don't know why I always wear this shirt when I have henna done... now its kinda like my official henna application outfit. So get ready for the return of my green wedding sari (from the R & S affair), it’s wedding time in the American-Nepali Household!! Did I mention there is another wedding on Friday? Preheated Oven: Where is my bun? 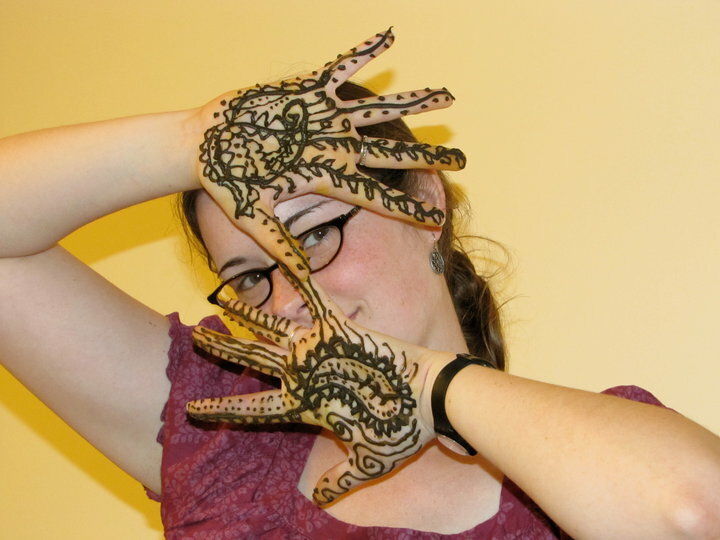 Intercultural relationship blogs with a South Asian twist!